Microsoft has created a very powerful tool for the computers running on Windows Operating System. This tool is called Command Prompt, or Windows Command Processor on an official note. As the name suggests, Command Prompt deals with a set of valid commands to manage the files on your computer. You can also run your system through the command prompt, although it would be a troublesome task. It becomes a little complex because the command prompt uses only the words(commands) to do every single operation, be it creation of a file or opening or closing. Basically, the command prompt is a Command Line Interpreter and it uses an interface known as Command Line Interface to interact with the user. 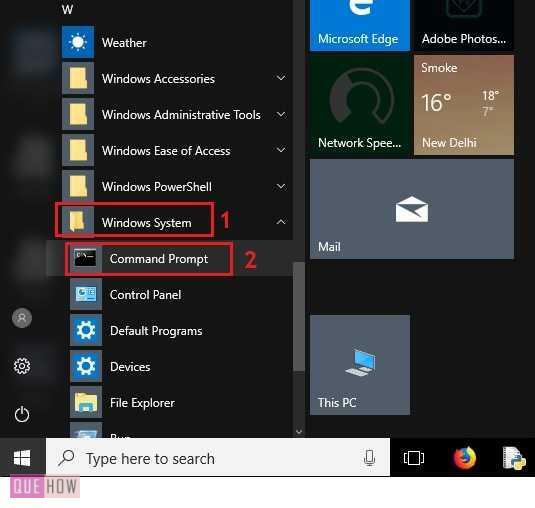 In this article, we are going to describe multiple methods to open the command prompt in general mode and administrator mode as well on Windows 10. Administrator mode lets you run those commands which need some particular permissions and credentials which are not granted to the general users. Step 1: Open the Power User Menu by right-clicking the Windows Start button in the desktop or press ‘Windows+X‘ on the keyboard. The Power user menu contains some special features and quick access for some programs & tools like Task Manager, Run, Search etc. This menu was first seen on Windows 8. Step 2: Click on Command Prompt to open the prompt for the general user. Administrator Mode: Click on Command Prompt(admin) to open it for the administrator. Step 1: Type ‘Command Prompt‘ or just ‘cmd‘ in the Seach box present on the taskbar. The command prompt will appear at the top in the list of results. 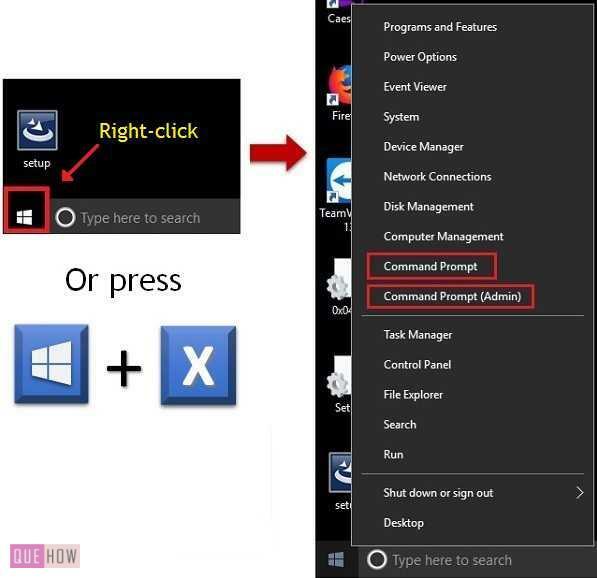 Step 2: Simply Left-Click on Command Prompt or press Enter to open it in general mode. Administrator Mode: Right-click on the Command Prompt and select ‘Run as administrator’ to open it in Administrator mode. Directly press ‘Ctrl+Shift+Enter‘ after the list of results appears. This will open the command prompt for Administrator. 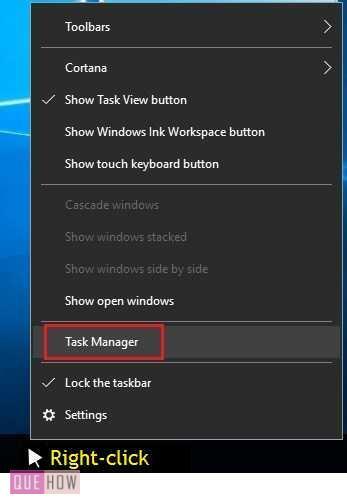 Step 1: Right-click on the taskbar and choose Task Manager from the menu. This will open the Task Manager. You can do the same with the help of Search box also. 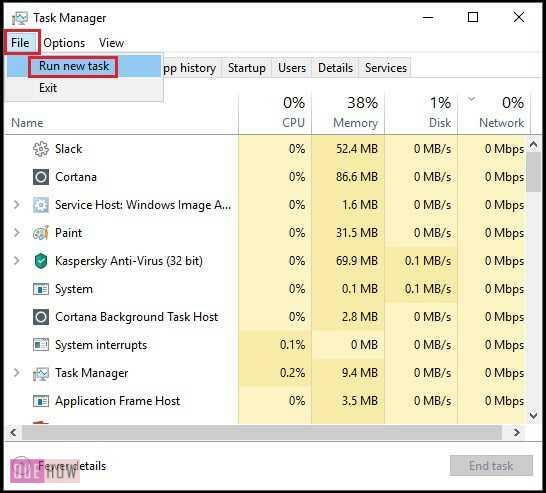 In the Task manager, you will find the list of running process and their performance analysis. Step 2: Click on File and then select ‘Run new task‘. Task manager gives this option to open a new program or file. As you click on ‘Run new task’, a dialog box appears, asking you the name of the program you want to open. Step 3: Type ‘cmd‘ and click on ‘OK‘. The command prompt will be opened in the general mode. Administrator Mode: Click on the checkbox given just below the typing area (as shown in the image above). This option provides the administrator privileges to the user for any program. Press “Ctrl+’Run new task’ ” in Step 2 itself. This will instantly open the command prompt in administrator mode. Step 1: Open Windows Run tool by pressing ‘Windows + R’ on the keyboard. You can also type Run in the search box and open it. Step 2: Type ‘cmd‘ and click ‘OK‘ or press Enter key. This will open the command prompt in the general mode. 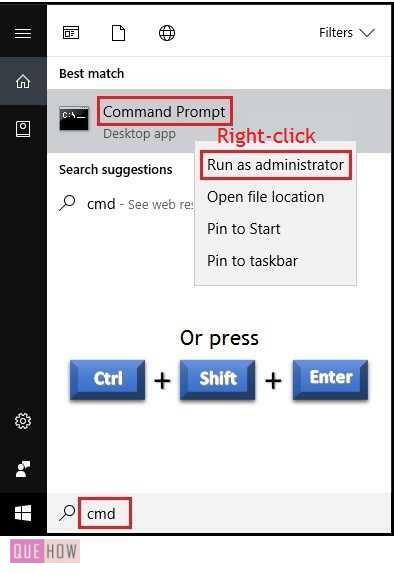 Administrator Mode: Type ‘cmd‘ in Windows Run and press ‘Ctrl + Shift + Enter’ instead of only ‘Enter’ to open the command prompt as an administrator. Step 1: Open the Start menu and scroll down the alphabetically arranged list of programs till you reach the ‘W‘ section. Step 2: Click on the folder named ‘Windows System‘. This will show you the programs present in the folder. You can also use the arrow keys to navigate through the folders in the list. Step 3: Select Command Prompt and press Enter. 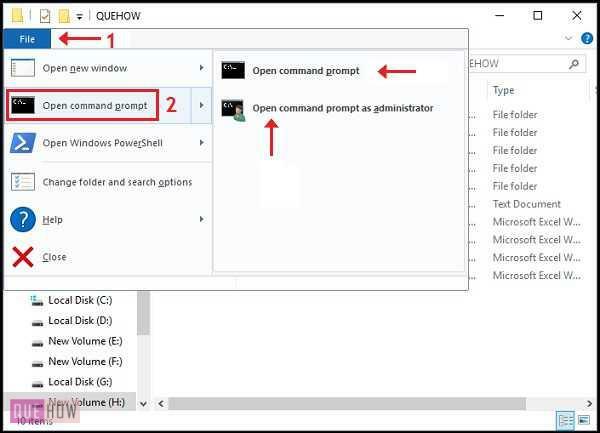 This will give you the access to the general mode of the command prompt. Administrator Mode: Go to Command prompt using arrow keys & press ‘Ctrl + Shift + Enter‘ to run it as an administrator. This shows that the command prompt is opened at Folder c:\Users\TS7. You can open the command prompt at any other folder present in your computer. Step 1: Go to the folder where you want to open the command prompt and double-click to open it. Step 2: Click on File. You will be given three options, to open New Window, Command prompt & Power shell. 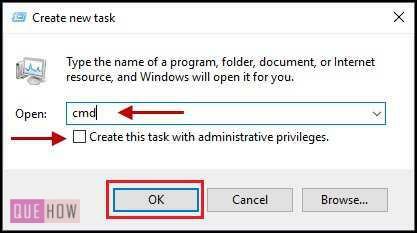 As you go to Open command prompt, another two choices will be given as, open command prompt & open command prompt as administrator. Step 3: Select either of the options and the command prompt will be opened according to your selection. You can now see the path of the opened folder in the command prompt. That’s it! You have successfully opened the command prompt at the folder.